THE U.S. Patent and Trademark Office (USPTO) under deplorable Andrei Iancu arrogantly chooses not to obey the Federal Circuit. Yes, it’s similar to Battistelli at the EPO, but that’s a separate matter (for our next post). Patent Trial and Appeal Board (PTAB) inter partes reviews (IPRs) are besieged, but they carry on. Unified Patent has just announced the hiring of several more people, who certainly will deal with IPRs. IPRs are the law, they’re protected by SCOTUS, and are an integral part of AIA. This is the source document [PDF] and the screenshot is included at the top. This is especially worth noting because Janal Kalis, a vocal patent maximalist, has cherry-picked another bit to frame it differently. He’s trying to claim that CAFC is dissenting against 35 U.S.C. § 101, based on almost nothing (maybe a sentence from one judge). 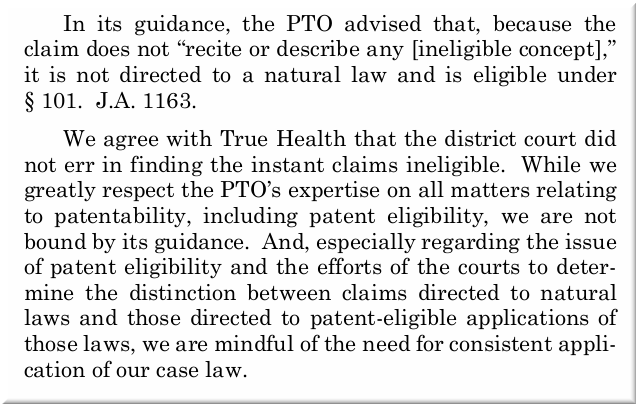 Kalis and others in the patent extremists’ ‘community’ nowadays have a new strategy: claiming CAFC is ‘fed up’ with § 101. This is hardly supported by any evidence, however, but rather an incident or two, maybe a few words in some text. Like Judge Moore’s statement last year (about intervention at another, unspecified level, as we covered at the time).